The student-run Atkinson Gallery Annex is a long-standing tradition of the Atkinson Gallery. The Annex proudly hosts student exhibitions curated by the Atkinson Gallery Intern. The Atkinson Gallery is very excited to be partnering with the John Dunn Gourmet Dining Room to continue this student driven program. Alchemy of Light & Space features a group of ten talented student artists from Santa Barbara City College whose conceptual interpretations of the theme are executed with different materials, styles, and techniques. Through the creative process and the expressiveness of each artist, their individual perceptions are determined of their unique understanding of the spaces they inhabit. For instance, the horizon line implies the impossible meeting of sea and sky. Space may be defined either by presence or absence when the interior volume is revealed. Light helps shape an artwork to give depth, perspective, and volume. Featuring paintings, sculpture, graphic illustration, and photography, this broad selection of works is a representation of the student work created in the Art Department here at Santa Barbara City College. 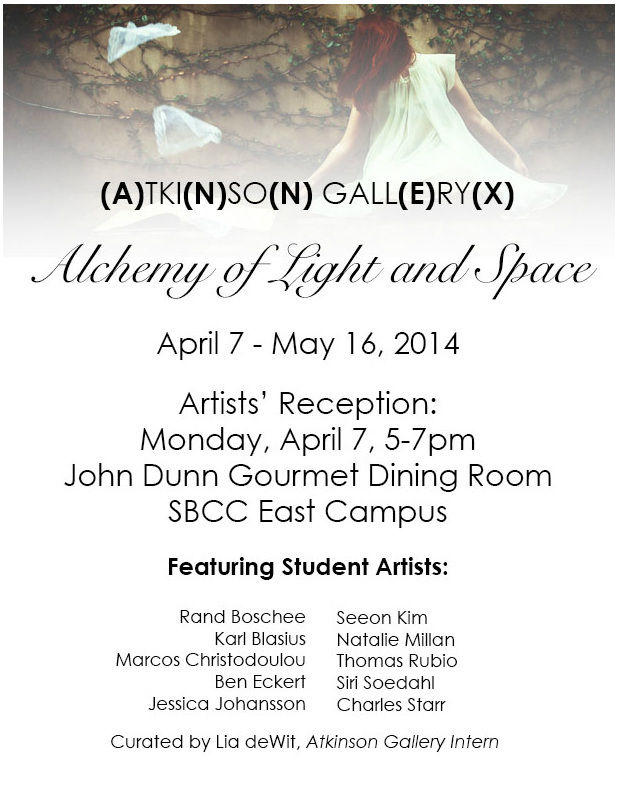 The Atkinson Gallery Annex is honored to show the works of these wonderful student artists.